The latest tally of the homeless population in Forsyth County shows that there are 440 homeless people in the county. The United Way of Forsyth County conducted a “point in time” count of homeless people and has submitted its report to the Winston-Salem/Forsyth County Commission to End Homelessness, Mayor Allen Joines of Winston-Salem said Tuesday. Forsyth County had a population of 376,320 people as of July 1, 2017, according to the U.S. Census. The count of the homeless is conducted as part of the requirement to get federal money for programs that help homeless people. The tally also helps city and county officials gauge how they are doing on a plan to end chronic homelessness, which is defined as having a disability and being homeless for a year or more, or having four episodes of homelessness over a three-year period, said Kathleen Wiener, the grants and projects manager for the United Way of Forsyth County. 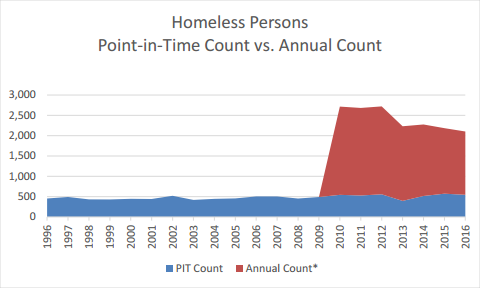 The latest count of homeless people shows that there are fewer chronically homeless people in the city than in past years, Joines said. There were 453 homeless people in Forsyth in 2017, and 544 in 2016, said Tim West, a program supervisor with the city’s Community Development Department.